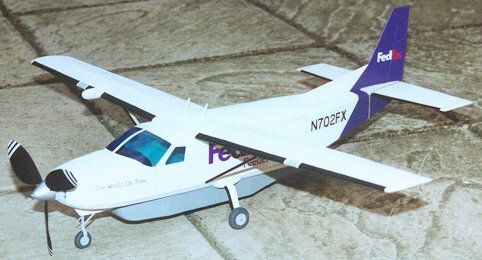 This 1/24th scale Cessna Caravan is officially a Model 208B Super Cargomaster, according to the scale drawings I have. Federal Express use over 250 of these aircraft to ferry parcels to smaller airports, so I guess they are a pretty common sight in the USA. The inspiration for the model came from the Pres Bruning peanut design. Doubling the plan in size to give a 26" wing span makes the model almost exactly 1/24 scale, and gives a nice size for outdoor flying. When you double a peanut design, it becomes apparent that some compromises that are made on the smaller model to reduce weight and increase flight performance just do not look right when made twice the size. An example of this on the peanut is a flat bottom, with the baggage pannier flush with the fuselage sides. On mine I pulled up the lower longerons and added formers the same shape as those on the top to give the required rounded corners. The pannier was made narrower, fitting on the flat portion of the fuselage bottom. The fuselage box is 3/32" square, formers 1/16" and the stringers 1/8 x 1/16", edge on. After finishing the wings, I discovered that the plan view did not correspond to the sets of scale drawings I had obtained. At least I had not covered them yet, so I was able to cut off the trailing edge, and add a new one, running straight from the tip to just short of the fuselage, where it cuts in slightly. I fiddled the existing ribs by sanding them down to meet the new trailing edge. Unfortunately, I obtained a fair collection of wrinkles at the rear of most of the ribs, because I could not get them completely flush again. I made the model one piece, so no knock-off wing, to save weight - this may or may not prove to be a good idea. At this wingspan we are pretty well on the limit of survivability if the plane came down heavily on one wing. The wing was actually covered and doped before building it into the fuselage, then the top stringers added to fair the centre section in. 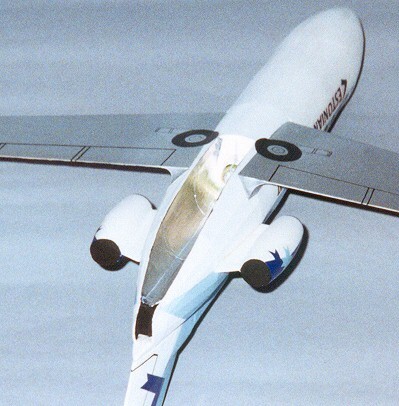 To help reduce warps, the structure of the fin and tailplane was altered to be triangular. 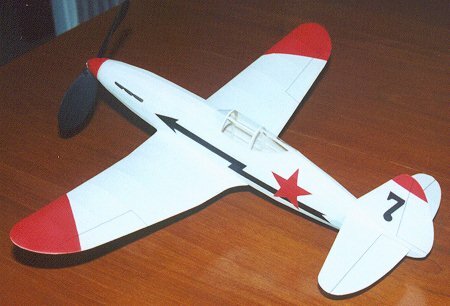 The tailplane was made out of 3/32" stock, the fin (with hinged rudder) 1/16". The tailplane was held in place with a rubber band until the trim was sorted. The canopy was stretch moulded over a balsa mould, and sprayed lightly on the inside with Tamiya clear blue acrylic paint to give it the required tint. This was attached, and the edges sealed and tidied up prior to painting. The undercarriage is designed to deflect and absorb at least some of the landing shocks. The rear nosewheel strut is attached to the main leg with UHU adhesive, which always stays a bit rubbery, and sits in a slot at the rear, so it can travel into the fuselage. The main gear legs are not attached to the card fairings at all, so can move freely. Wheels are laminated balsa. 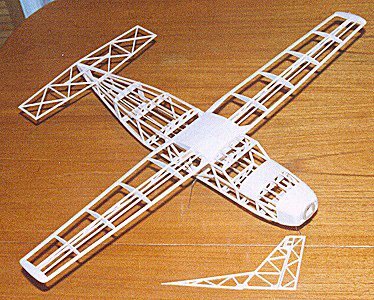 The prop has a balsa hub and blades cut from a plastic cream container (cut at 15 degrees to its vertical axis). 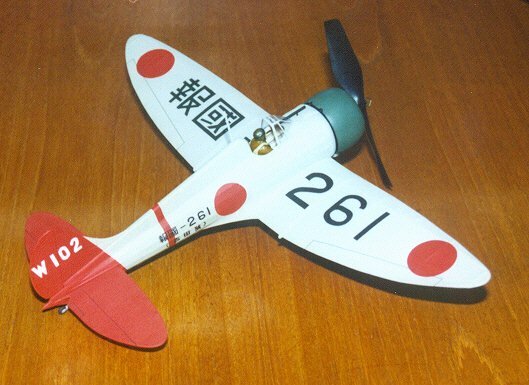 The model is covered in Japanese tissue (Esaki) and sprayed as usual with enamels - mostly Humbrol, but the Purple came from Xtracolor - a specially matched shade for Federal Express. Control surface outlines and doors are outlined with a Rotring pen. Most markings are home made waterslide decals, printed using a thermal wax transfer printer. A rare calm summer evening allowed flight trials to commence. 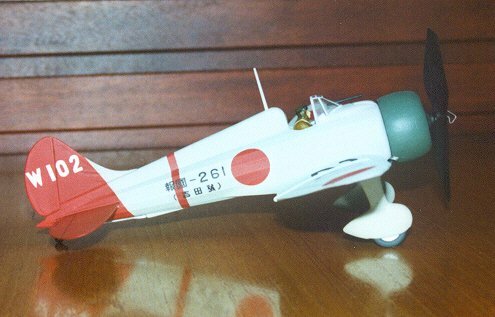 The rear of the tailplane required shimming 1/32" as the model was nose-heavy off the board, and the rudder was offset slightly to obtain a left turn. Some downthrust was needed to prevent power stalling. After a few flights, it became apparent that the model had a disturbing tendency to drop its left wing, especially if disturbed by the breeze, so (reluctantly) a clear trim tab was added to the left wing, and bent down slightly to keep the wing up during the turn. This cured the problem, and subsequent flights were more stable. I flew the model again a few weeks later at the Old Warden vintage meeting, and made 5 virtually identical flights, so it looks like the trim is now sorted. I am using one loop of 1/4" rubber for power, and flights are around the 25 second mark - I am sure there is more to come with a longer motor. 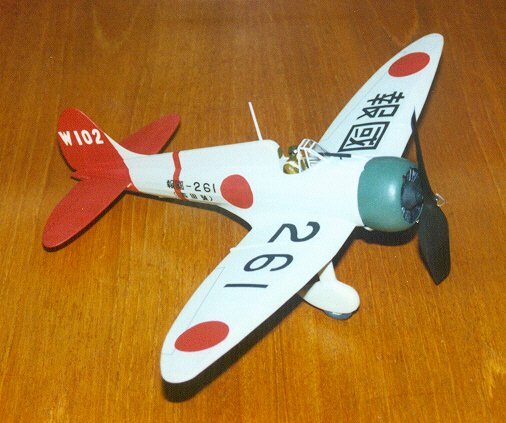 Despite its size, this model has now proved a reliable indoor flyer, using the same 1/4" motor, once a bit of right thrust had been added, together with a touch of left rudder. The side thrust compensates for the torque effect when more winds are put on, keeping the model in a left hand pattern even when the motor is running down. Without the sidethrust and left rudder, the model straightens up for landing as the motor torque falls off - fine outdoors, but not conducive to long life in a sports hall! The tricycle undercarriage makes for good take-offs and smooth realistic landings. 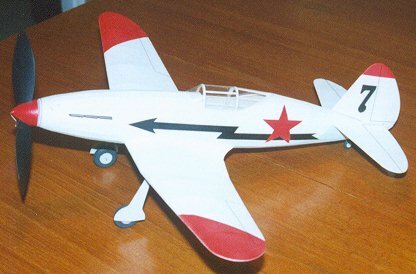 Here are a couple of shots of my vintage Mig 3, designed by the legendary Earl Stahl back in January 1943, and published in Model Airplane News at the time. Earl’s models were always fine fliers (something that could not be said of many of the designs of this period), so I have high hopes for mine. As can be seen from the picture, it has not been flown yet (waiting for the right weather). Wing span is 22.5"
Construction is exactly as per the plan - I like building vintage stuff as authentically as possible, and unlike, for example, most "Dime Scale" models, this one needs no modifications to make it a practical flying machine. In which case, why change anything? The model is not particularly accurate, but remember, Earl was working from the few photos available at the time, and the finished model certainly looks sleek and purposeful. The prop is balsa, carved to the block dimensions shown on the plan. Admittedly the airbrushed finish is not totally in keeping with a model of this vintage, but I could not resist doing one of those nice Russian winter schemes, and unpainted white tissue would just never look as good. This was a quick build to have something to fly in kit mass launch events. 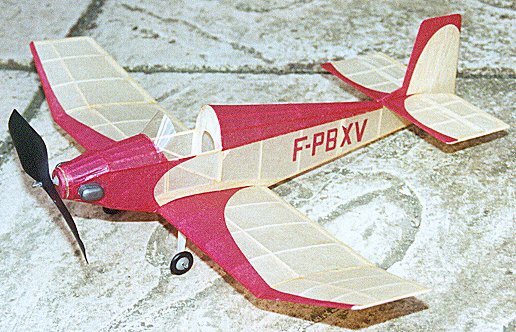 The model was built using the old Veron Tru-Flite plan, designed by the late Phil Smith. No changes were made - Phil's designs usually fly well, especially if you use your own wood, and keep the model light. Wingspan is 18", and mine came out at 29.5 g, including the Tern 6" prop and some lead noseweight to get the c of g correct. It flies very nicely on a loop of 3/16" rubber. Finish is SAMS Super-Lite tissue - beige overall, with maroon tissue trim, cut to the outlines shown on the plan. 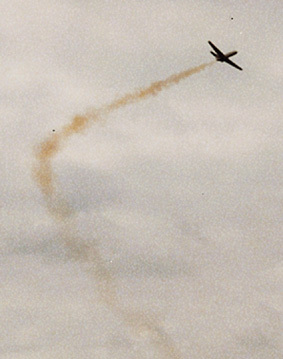 Since penning the above, the Jodel has decided to pursue an outdoor life near the top of a tall tree at Old Warden aerodrome (August 2000). I hope it is happy - give it a wave when you are next there! Here are a couple of photos of my first airliner design for Rapier jet power. Span is 18 ", which sounds a lot for an L2, but the wing is very high aspect ratio. One thing this subject has going for it is lots of dihedral - scale dihedral at 18" span is 1" per tip, which I have pushed up to 1.25". The parallel bit of the fuselage is 1/32 sheet wrapped round formers with just four keels fitted. The nose section is hollow block balsa carved to shape to match the keel piece I fitted. Tailplane is enlarged, and done from sheet to keep it simple. The photo below shows the motor installation - the tube is placed above the wing centre section, with the trough starting about 2/3 of the way back from the wing LE. The trough is very deep, but I don't seem to suffer loss of thrust because of this. The wing centre section behind the main spar is boxed in with hard 1/16" sheet in the expectation of wingtip crashes! The model is covered with white Japanese tissue, and fully airbrushed using Humbrol enamels thinned with cellulose thinners. 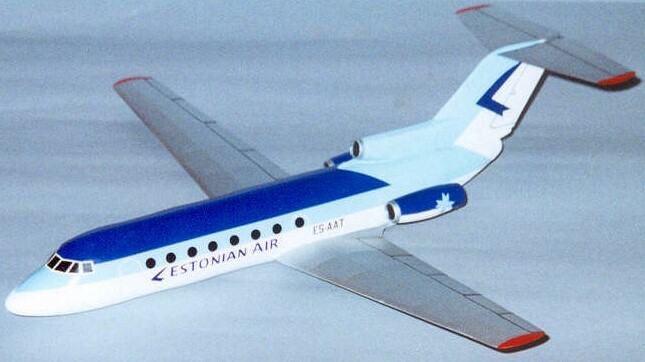 The fuselage titles are home-made decals made with a colour printer, as are the cabin windows and retracted main wheels. The cockpit windscreen is made from sections cut from painted black decal sheet. All up weight is a rather hefty 35 grams, but light enough for a Rapier L2 to cope with - the aim was to go for a powered glider" approach, rather than a mad dash for height, followed by aerobatics. After an unsuccessful attempt earlier in the year, I had another go at trimming it at Old Warden in May 2001. 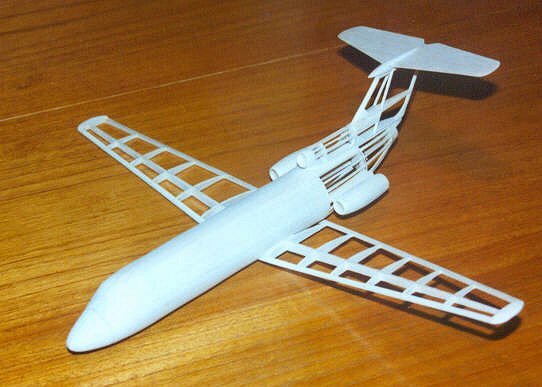 One problem with this model is that it is tricky to launch, because you have to hold the fuselage in front of the wing. It is easy to inadvertently hit the wing as the model leaves the hand, putting it into a big wobble just when you least want it. I got best results when leaving a decent gap between my hand and the wing, and taking a run-up combined with a gentle release. Difficult to do every time though, however much you practice, especially if there is a crowd watching! I gave it another couple of successful flights afterwards, during one of which it got into quite a steep banked turn, but it resisted the urge to spiral in (probably due to all that dihedral) and landed safely. This is a peanut scale model (so 13" span) but because of the small size of the prototype it is quite a large scale model at 1/20th. The model is based on the old Alan Callaghan design but with a few modifications. Firstly the complex working sprung undercarriage was ditched to save weight, and replaced with my usual simple single wire legs, free to move independently of the scale structure. I also added more wing ribs to give scale spacing, and dropped the spar so that it would not be visible through the tissue. 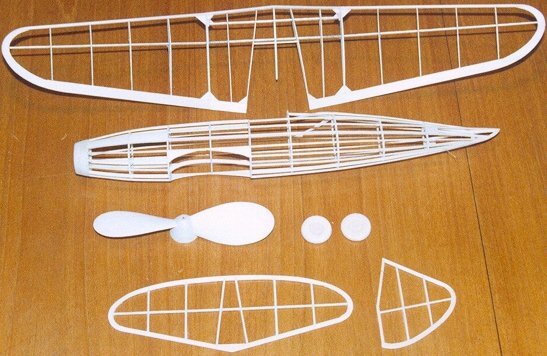 Fuselage structure is mainly 1/20" square, with 1/32" x 1/16" stringers (edge on). Flying surface tip outlines are balsa laminations, and the fin and elevators have been made as separate items to aid trimming. The model is covered with Japanese tissue and airbrushed with Humbrol enamels. The scheme represents one of the Luftwaffe aerobatic team aircraft that put on a display to 100,000 spectators and assorted visiting dignitaries (including Allied Generals), in Belgium in July 1939, less than two months before the outbreak of the second world war. 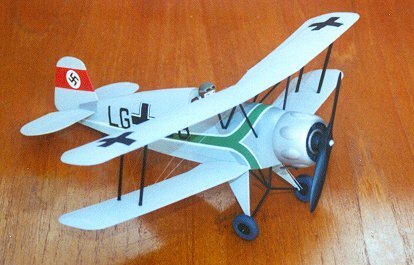 The planes carried an attractive green and white fuselage flash, and (happily) did not have mudguards fitted, so that saves a tricky modelling job! The photo below shows one of the team aircraft. 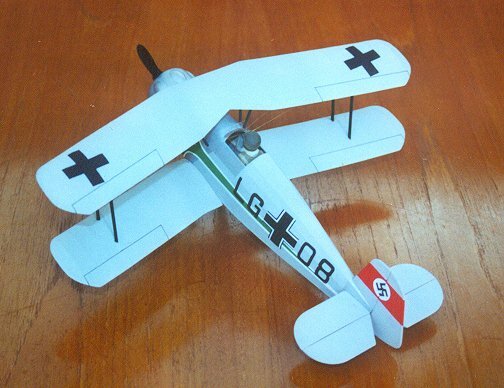 I am happy to report that the model flew pretty well straight off the board - just a small amount of Blu-Tac was added to the cowling, and a touch of left rudder had it circling round as if on rails. This is a very stable design - the sweep back on the wing must help. Power was originally one loop of 1/8" rubber, about twice the distance between the motor hook and rear peg, but I have now upped this to four strands of 0.090" of the same length. It looks very realistic in the air, and takes off happily with the more powerful motor. Best time to date is 41 seconds ROG. At the end of the day, it is a bit too heavy to be a really competitive peanut - Mike Hadland’s similarly sized Bucker Jungmann (winner of the peanut class at the 2000 and 2001 BMFA indoor Nationals) only weighs 12 grams, and can do flights of over 50 seconds on a loop of 1/8" rubber. Still - gives me something to aim at. Since writing the above, the model has proved successful in the BMFA open rubber class, where flights are judged on realism rather than duration - here a 30 second flight is plenty. The model cruises round in nice wide circuits after take-off, and lands very smoothly and realistically. The plan for this model, designed by Nate Sturman, was included with an issue of Flying Aces News, and I couldn't resist building it. It is to 1/24th scale, giving a span of 18". A very nice looking plane I think, with its elegant eliptical wings, open cockpit and spatted fixed undercarriage. I stuck pretty closely to Nate's design, though I filled in the cowling between the stringers with soft 1/8" sheet, then sanded it smooth. I also hinged the fin with soft wire to help with trimming adjustments. The prop is a 6" Tern plastic item. The model is covered with white Japanese tissue, and sprayed with Humbrol enamels. The fuselage script is done with home made decals, but everything else is masked and airbrushed. After discussions with the model's designer, I decided to trim the model for a left turn, as my left wing has slightly less washout (so more incidence) than the right wing. More incidence on the inside of the turn should help to prevent the wing dropping. Test hops in the garden showed that a bit of noseweight was needed, so I added some Blu-Tac inside the cowling. A bit of left rudder, and it looked quite promising. Next step was to try it out in a large sports hall, and it was soon cruising round nicely from a hand launch in left hand circuits - dicing with the roof structure on one occasion. I had put in some down and right thrust by this stage. Power is one loop of 3/16" rubber, and this seems ample. Next step was to try some take-offs, but unfortunately every time, the model left the ground nicely, then flew gracefully into one of the far walls - it would not pick up the left hand pattern that it did from a hand launch (at least not in the confines of the hall). Outdoors it flies a treat, and with the addition of a little more side thrust, I now have it going in large, stable left hand circuits. 2003 update: I finally did get the model to fly nicely indoors, by tightening the left turn. The take off run is long and straight, then the model climbs out in a gradual left turn. It then climbs in a much tighter turn, which it maintains until landing. The landing is the weak point, because the wingtip tends to drop as the power come off, often just before touchdown. I am still very pleased with it though. OK, I know this is not a scale model, but it is "scale-ish", so I am including it anyway! 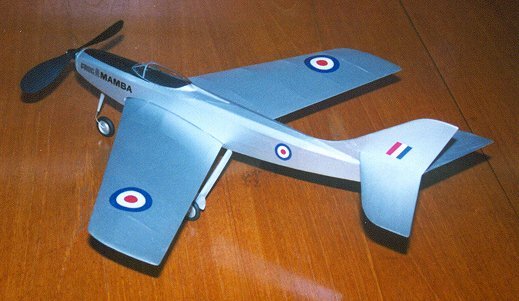 The design dates from 1954, and was an attempt by the Frog company to produce a kit of an aircraft "similar to those coming into service with the RAF". I reckon it has more than a hint of the F.86 Sabre about it. Wingspan is 19". The cockpit canopy I used here is one of the old Keil Kraft items from their scale Jetex range. These are still available from SAMS models, or Lindsey Smith's "Small Scale Custom Services" (see Useful addresses). The finish is Xtracolor RLM 01 Silber enamel over white Japanese tissue. 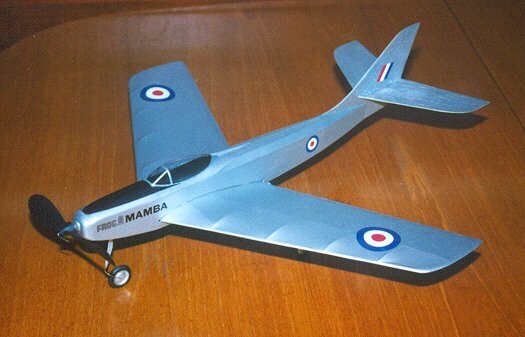 The model had its first flights at Old Warden in May 2001, and it flew virtually straight off the board. I changed nothing on the plan, left all flying surfaces untouched, and all it needed was a small blob of modelling clay at the back to move the C of G fractionally and improve the climb. It is obviously a very well designed model - there is very little dihedral shown on the plan, but it didn’t need any more - she looked very stable - due no doubt to the wing sweep. One loop of 3/16" rubber was all she needed for gentle circuits. In March 2002 I decided to see what would happen if I put in a loop of 1/4" rubber instead of the 3/16". I removed the clay from the tail, as the heavier rubber shifted the C of G slightly rearwards anyway. The results were a revelation. First flights with the new rubber took place on Greenham common on a windy afternoon, and the model performed much more like a jet fighter! Climb was very impressive and on the final flight, with 900 turns on, I very nearly lost it out of the field - the model got very high, circling left and seemed totally unphased by the windy conditions. Really an excellent design.